To Evelyn Patricia Terry, creator of a bus-shelter-turned-work-of-art near Lindsay Heights, the structure is valuable because public art is visually appealing and shows that people in the community care about where they live. In African American communities such the greater Lindsay Heights area, there isn’t a lot of public art, Terry noted. She orchestrated the public art project six years ago, with the help of local artists, a writer, community and academic organizations, and businesses. Terry discovered that the shelter had been parked in the Milwaukee County Transit System’s back lot on 17th Street, off of Fond du Lac Avenue. A car ran into the stop on St. Patrick’s Day, March 17, and it had to be removed because it was damaged. Terry tracked down the missing shelter with help from Sandy Kellner, chief operating officer at Milwaukee County Transit System, and sought to have it repaired. 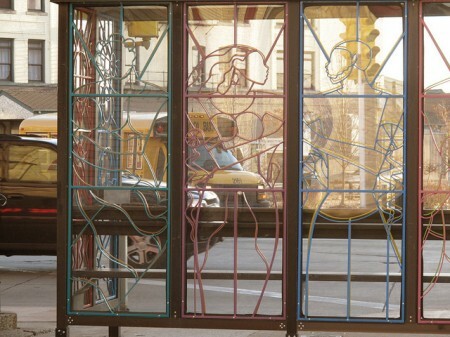 She received funding from the Spirit of Milwaukee for the shelter frame and from Millennium Neighborhood Art Initiative—the original project sponsor—for restoration. This fall, the shelter was reinstalled in its rightful place. 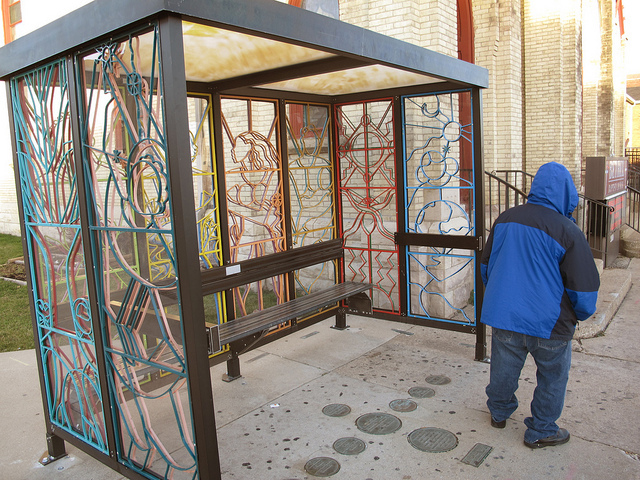 On a recent cold day, a handful of transit riders were non-committal when asked if they were glad the shelter is back. “It’s good it’s here,” said one man. Others had no comment. Nsoroma feels much more strongly about the shelter. I think the Art dept. combined with other classes at each High School should work at making each bus shelter unique! Kids feel pretty good about actually making a difference ..